Melton RFC saw off familiar Northamptonshire foes Wellingborough on a bitterly cold day, with the game in doubt right up until a midday pitch inspection. 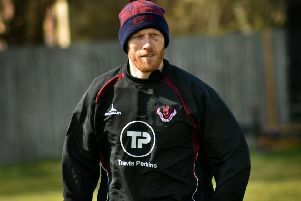 Head coach Gareth Collins made just one change for the home side after the previous weekend’s narrow win, and it was important to step up the performance against a side with a very similar record in the league this season. The early exchanges were even with both sides getting the measure of the conditions and probing for an opening. There was a sniff of a chance when Sam Badham found himself in open play, but with a long way to go to score, his legs didn’t quite have the energy to outpace the cover. Resolute defence from both teams kept the scoresheet blank for the first quarter, but the stalemate was broken when a Wellingborough attack broke down in Melton’s half. Turnover ball saw Leon Gormley break out and sell a sublime dummy, leaving a well-timed pass to give Harry Wood a stroll in for the opening try in the corner. The next score followed shortly after when Dan Wakefield stole lineout ball deep in Melton territory. Chris Rose scented half a chance and a smart blindside break saw Wood on his shoulder who used his pace to beat the scrambled defence and score his second try. Wellingborough continued to attack at every opportunity, but Melton’s defence was markedly less generous than seven days earlier, with Ollie Circuit and Adam Woolley leading by example with some stunning tackling. A well-judged kick deep into Wellingborough’s half saw a poor clearance kick from the visiting full-back covered by Jack White who returned the ball with interest. Brushing off a couple of tackles, and with good support from Marcus Badham and Kieron Stone, the counter-attack paid dividends when Rose took the scoring pass to open up a 15-0 lead. Melton seemed to enjoy attacking from deep in their own half as James Long launched another move, as slick handling from forwards and backs gave Matt Cox a chance to use his trademark shuffle and miss-move in the three-quarters. Harvey Green caught the defence flat-footed with a clever chip and chase, remarkably gathering his own kick and off-loading to Will Helliwell who streaked passed his opposite number and gave a lovely return pass for Green to dive over in the corner. A try of the season contender with a flowing move spanning almost the length of the pitch. Melton turned the screw as the scrum dominated with the front row of Kieron Stone, Marcus Badham and Luke Pawley giving the Wellingborough front row a torrid time. A collapsed scrum saw Dan Wakefield orchestrate a lineout catch and drive as he ruled the set piece all afternoon. Kieran Bugby was driven over for a fine forwards try with Green taking over the kicking duties and landing the conversion from out wide for a comfortable 27-0 half-time lead. Wellingborough obviously received a stern lecture at the break and started the second half far better as some judicious attacks caught Melton napping. Showing flashes of what they are capable of, the visitors drove forward in numbers, while the hosts sat back too much. Their bold approach paid off when some smartly-taken chances gave them a converted try. They pressed home the advantage and scored a second try soon after when the winger used an overlap to score out wide. Concern crept in that Wellingborough may claw their way back into the game, but the Melton pack would not be rolled over. Another collapsed scrum resulted when Christian Jeremiah came on to add fresh legs in the front row. Cox kicked deep into the opposition half, and Sam Badham took clean ball from the ensuing lineout to set up a rolling maul as the forwards drove back the Wellingborough pack. Kieran Bugby wrestled his way over from close range for his second try of the afternoon, and Green struck an excellent conversion in the swirling wind to increase the lead. However, the final word came from Wellingborough when Melton bizarrely decided to try and run the ball out of defence. A soft interception gave the winger an easy stroll under the posts for a converted score which flattered the visitors. But Melton can be well pleased with their afternoon’s work as a bonus point win helped consolidate their league position, lifting them up a place to eighth. Melton: K. Stone, M Badham, L. Pawley, J. Long, S. Badham, D. Wakefield, K. Bugby, L. Gormley, C. Rose, M. Cox, O. Circuit, H. Green, A. Woolley, H. Wood, J. White, W. Helliwell, C. Jeremiah. * On Saturday, Melton welcome more Northamptonshire opponents when Old Northamptonians visit Burton Road for a 2.15pm kick-off for their final fixture of 2017.